Happy hump day! This is the gorgeousness I get to experience everyday when I walk down my street, I swear the blooms this kind of year make me so happy (insert all the heart eyes)! 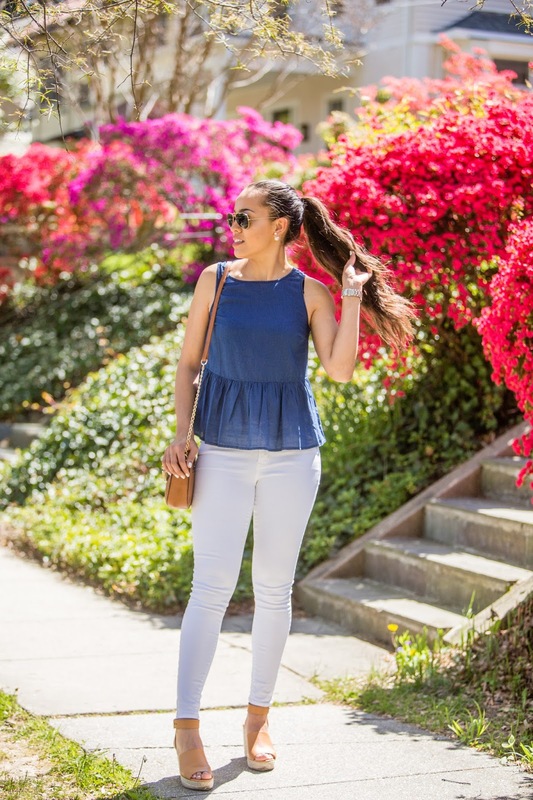 This chambray peplum is actually more of a linen, light cotton material then it is chambray which is great for the warmer weather but having chambray in the name is definitely deceiving. Luckily I bought it in store so I knew what the fabric was prior to seeing the online description. I know I am looking a little patriotic with the blue and white then the red flowers but I couldn't resist shooting at such a perfect location especially when it is a block from me. 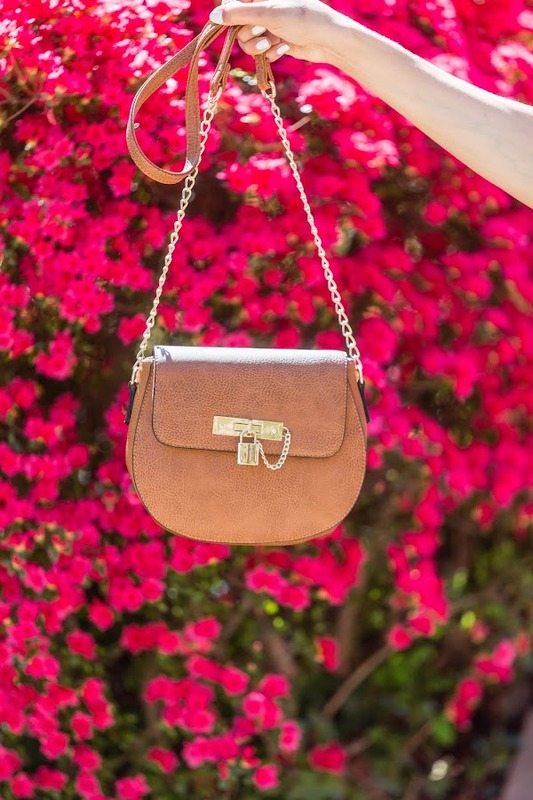 I have been searching high and low for a Chloe dupe, and I think this one is perfect for the price point, but I also love this one with the buckle detail and at 50% off, I may just need to scoop it up as well! This may be my favorite look so far this Spring, really I love anytime I can wear white denim, they give off such a crisp, fresh look that I absolutely adore. Linking up with What I Wore, WIWW, and Oh, Hey Girl! This is the perfect spring look! That peplum top is fabulous! 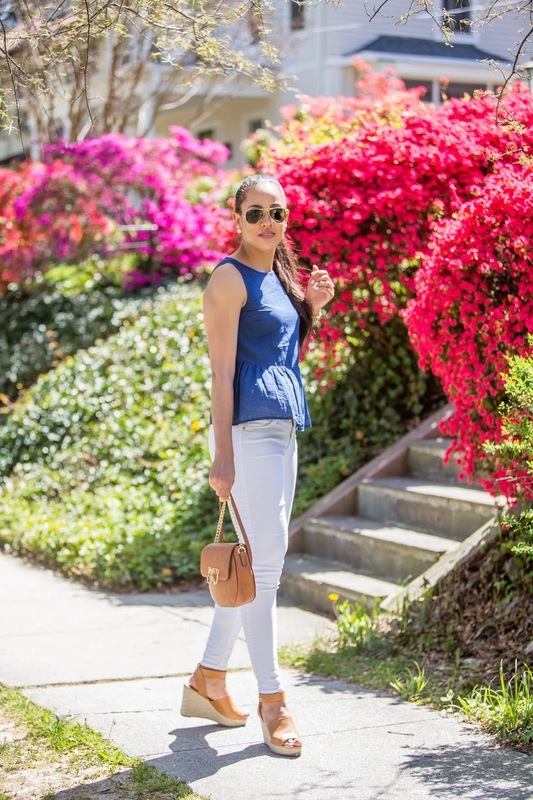 I love chambray and I love peplum! The marriage of the two makes this my dream top!! Cute outfit and those wedges look super comfy.